In a consent decree filed before a federal court, subsidiaries of Exxon Mobil have agreed to pay almost $5 million to state and federal governments over the 2013 pipeline breach that spilled crude oil into the streets of Mayflower, Arkansas. The US Department of Justice (DOJ) and the Environmental Protection Agency (EPA) announced on Wednesday that the pipeline subsidiaries of ExxonMobil will pay $3.19 million in federal civil penalties and $1 million in state civil penalties. They will also take steps to address pipeline safety issues and oil spill response capabilities. The oil giant will also pay $280,000 to the Arkansas Attorney General’s Office for the state’s litigation costs, and spend $600,000 on a project to improve water quality at Lake Conway. The settlement ends the joint federal and state complaint filed in June 2013 before the US District Court for the Eastern District of Arkansas. “This settlement holds ExxonMobil accountable for this very serious oil spill and its disastrous impact on the Mayflower community and environment,” said Assistant Attorney General John C. Cruden of the DOJ’s Environment and Natural Resources Division. He also noted that ExxonMobil did not admit liability in agreeing to the settlement. ExxonMobil’s Pegasus pipeline ruptured in March 2013. It spilled approximately 3,190 barrels, or 134,000 gallons, into the streets of Mayflower, Arkansas, about 25 miles (40 kilometers) northwest of Little Rock. The pipeline carried heavy crude from Canada’s Athabasca oil sands between terminals in Illinois and Texas. The EPA classified the leak as a “major spill”, initially estimating it at between 5,000 and 7,000 barrels of crude oil. 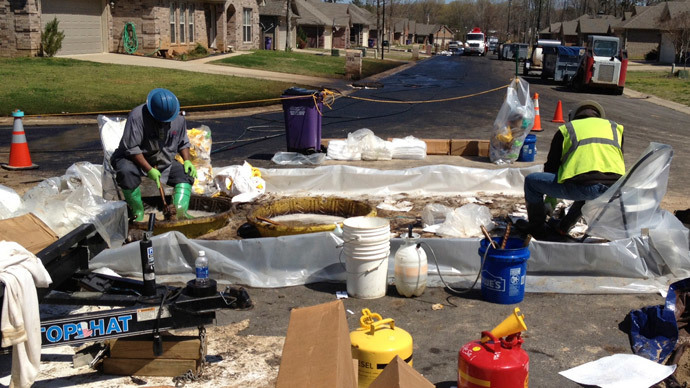 Mayflower’s Northwoods neighborhood was contaminated by the spill, which eventually reached the nearby creek, wetlands, and Lake Conway. More than 20 homes were evacuated and the residents remained displaced for an extended period of time. “All areas in Mayflower Northwoods subdivision have been cleared for re-entry or deemed with no restrictions for re-occupancy by the Unified Command,” a body composed of ExxonMobil representatives, local and federal officials, ExxonMobil told RT in February 2014. However, Mayflower has struggled to recover from the disaster, with many residents complaining about health problems. In April 2014, the town was devastated by a tornado that killed 16 people and destroyed up to 500 homes. The Mayflower spill contributed to the opposition of the proposed Keystone XL pipeline, intended to transport oil from the Canadian tar sands to US refineries in the Gulf of Mexico. Environmental activists have urged the government to reject the pipeline, arguing any spills would contaminate freshwater supplies. The EPA has agreed that the pipeline would pose a pollution and oil spill risk, and could contribute to global warming. Though both the Senate and the House of Representatives have approved Keystone XL’s construction, President Obama vetoed it in February.